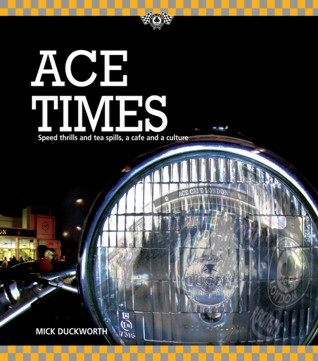 The long awaited comprehensive book “Ace Times” – speed thrills and tea spills, a cafe and a culture” relates and illustrates the definitive history of London’s Ace Cafe, a roadside pull-in that open in 1938 and became the most famous haunt of the motorcycle riding “Ton-up kids” in the 50’s and the Rockers in the 60’s. This book also tells story of the other venues and cafes, like the 59 Club, the Busy Bee and others elsewhere around the country. A substantial high quality, fully bound, 312 page hardback volume packed with personal recollections and evocative photographs, Ace Times also features the fastest motorcycles, the loudest music, the iconic movies and the distinctive clothing and styles of the cafe racing era. Burn ups, press hysteria, rock n roll riots, police baiting, Mods and Rockers, pirate radio and loads more besides, all unambiguously revealed.